This is an image of the Grand Central Depot. On the building itself, you can see the names of two of the three railroad lines that fell under the NY Central and Hudson Railroad company: NY and Harlem Railroad and New York and New Haven Railroad. On the lower left of the image, you can see the rail tracks intersecting the pedestrian walkway, which were one of the major concerns that led to the downfall of the Grand Central Depot. “But there! The bell sounds and we must aboard. This is our train, here on the right. Now we are seated, the bell rings again, and off we go.” This was an account from a passenger boarding a train as recalled in the book, “Homes of the Sound For New York Business Men…”. The Grand Central Depot served over 15 million passengers a year, averaging 48,600 passengers, day in and day out. 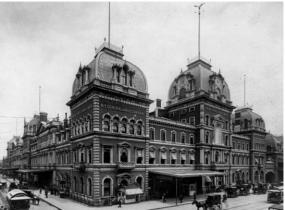 The building of the Grand Central Depot in 1871 was truly the start of something new. It is important to note that the opening of the Grand Central Terminal caused a majority of the people to forget the idea of the Grand Central Depot. As I was conducting research on the Grand Central Depot, I noticed much of the information of the Grand Central Terminal was intermixed with the information about the Grand Central Depot. 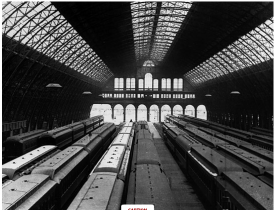 My goal is to pull out hidden sources and personal accounts about the Grand Central Depot and to show the impact it had not only on New York City, but also our nation as a whole. Towards the end of the Civil War, the railroads grew and had a great impact on the nation. Railroads were one of the reasons society was able to shift from an agricultural society to an industrial society. Railroads connected cities with other cities and farms. Railroads helped greatly with time and distance. The cost of transport went down and it was much easier and faster to transport not only people, but goods as well. Cornelius Vanderbilt was born in 1794 in Staten Island, NY. He was known as one of New York’s wealthiest people during the 19th century. He built steamships and oversaw the operation of ferry lines connecting the different boroughs of New York. By the 1860s, he had changed his focus from ferries and boats to railroads. He was interested in building railroads to Manhattan Island. One of New York’s first railroad companies was built in 1832 and was called the NY and Harlem Railroad. This railroad company employed the idea of using horse carriages and placing them on railroad tracks between Manhattan and Harlem. There were other railroad companies that started up following that such as the New York, New Haven, and Hartford railroad and the NY Central Railroad to name a few. Vanderbilt really sought to take control of all of them and merge them under one company. Vanderbilt did exactly that, he took the NY central railroad, which was parallel to the Erie Canal and merged it with Hudson River Railroad to form the NY Central and Hudson River Railroad. The Hudson River Railroad company linked Poughkeepsie to New York City. In addition, he took the Harlem River Road and tried to integrate it with the NY Central and Hudson River Railroad. At that point, he controlled all of the direct rail stations on Manhattan Island and that soon came to be known as the parent company for Grand Central Depot. Grand Central Depot was this enormous building that took up almost 21 acres of land and it was very different from other buildings due to its appearance and size. Many people just came to the Grand Central Depot to visit and observe how the Grand Central looked and functioned because it was something they hadn’t seen before. Although the Grand Central Depot helped transform American society at large, people started to notice the flaws of it which led to its downfall and the building of the Grand Central Terminal. The Grand Central Depot was soon found to be too small; as the population grew in NYC, more people were prone to using the railroad station. By the 1890s, about 500 trains were using the Grand Central Depot. The station was at the end of the railroad track, so any incoming railroads would have to be reattached to the train cars heading in the opposite direction. It made it hard for trains to go either east or west because of it. The railroad station had poor ventilation. Many passengers complained about suffering from inhalation of steam and smoke while waiting for the train. In addition, a portion of the Grand Central Depot was given the name “The Death Alley” because a lot of pedestrians were killed by the trains. It was very dangerous to cross the streets because of the way the railroads were built. The resident explains the idea that these railroads were essentially taking over in a bad way. Furthermore, the resident continues to say that not only were the railroad tracks extremely dangerous, they also caused the residential property value to go down and the pollution and sounds of the trains were a nuisance to the people. In January of 1902, there was a crash in the Park Avenue tracks that ended up killing about 15 passengers and injured about a dozen people. This crash was caused by lack of visibility due to the steam of the trains. In 1903, the use of steam locomotives was banned in the south of the Harlem River. The city notified the people that this new ban would take effect in three years, in 1906. City officials believed that three years was ample time to fix up the station. Furthermore, this ban meant that the rail lines would have to be converted to electric power, but the way the Grand Central Depot was built, the entire station would have to be torn down in order for that to happen. These were just a few incidents that led people to have negative attitudes towards the use of railroads. 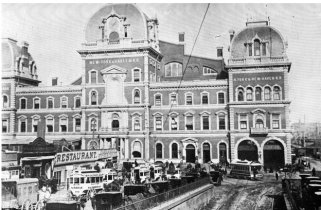 Many people wanted to revert back to using the horse carriages, but the impact of these issues were too big that the city had no choice but to build a new station which today we know as the Grand Central Terminal. Overall, the railroad industry helped expedite the industrial revolution by rapidly transporting goods and it allowed for people to have a faster mode of transportation. Although the Erie Canal was known for connecting the east with the west, the railroad industry added to that impact. It not only allowed transportation within the city, but it also allowed for transportation from city to city and to farms. In addition, the railroad system allowed the city to expand northwards and it provided employment for about 2,000 men. It is evident that society has been able to progress with the help of innovations and technology, which in turn supports our economy. Homes on the Sound for New York Business Men: A Description of the Region Contiguous to the Shore of Long Island Sound, Between New York and New Haven (New York: G. L. Catlin, 1875), 7. Kurt C. Schlichting, Grand Central’s Engineer: William J. Wilgus and the Planning of Modern Manhattan (Baltimore, John Hopkins University, 2012), 44.
http://www.history.com/topics/cornelius-vanderbilt (Accessed November 13, 2016). http://www.nytimes.com/2013/03/03/realestate/before-there-was-a-grand-in-central.html (Accessed November 13, 2016). Jeff L. Brown, “The Heart of New York: Grand Central Terminal,” Civil Engineering 833 (2013): 2. Jeff L. Brown, “The Heart of New York: Grand Central Terminal,” Civil Engineering 833 (2013): 39. “The Grand Central Depot,” New York Times, November 18, 1871, 1. “The Grand Central Depot,” New York Times, November 18, 1871, 4. Homes on the Sound for New York Business Men: A Description of the Region Contiguous to the Shore of Long Island Sound, Between New York and New Haven (New York: G. L. Catlin, 1875), 8. I came to this page to get information on the architectural style of The Depot, but was disappointed. I guessed it was Second Empire/Italianate, but I’m not sure.